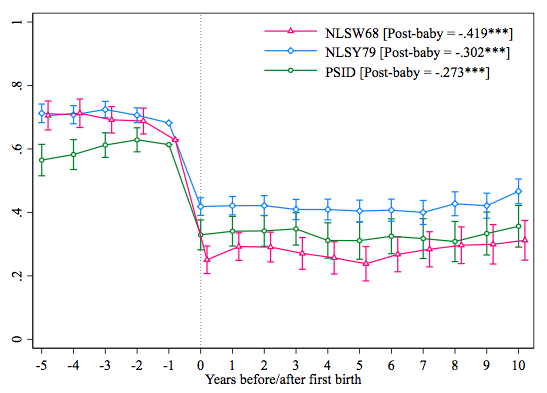 If women are not fully anticipating the employment effects of motherhood, we would expect that the birth of the first child serves as an information shock, causing them to update their beliefs regarding their ability to maintain both family and work commitments. Consistent with this idea, we find that women become more traditional in their attitudes about gender roles regarding work and family after the birth of their first child. For example, after becoming a mother, a woman is more likely to agree with statements such as “A family is harmed when the mother works outside the home,” and disagree with statements such as “Both a husband and a wife should contribute to household income.” Using an index of gender role attitudes that we construct using the available questions in each dataset, we find that women’s attitudes become significantly more ‘anti-work’ in the first two years post-baby and exhibit no recovery in the five years after birth (see Figure 2 for the UK). In fact, in the UK, women’s attitude change post-baby is more than the average difference in gender-role attitudes between men and women. Interestingly, college-educated women appear most caught off-guard by motherhood, as they experience a larger ‘anti-work’ shift in their views than non-college-educated women. We find little evidence of a significant shift in men’s attitudes. When we compare these expectations to reality, however, an interesting trend emerges. Whereas the class of 1968 overestimated the probability that they would be homemakers, the class of 1978 underestimated that probability. In particular, while over 60% of girls in the class of 1968 expected to be homemakers at age 35, only about a quarter of them ultimately were. (Note that all outcomes in this graph are plotted according to the year that a woman graduated from high school.) 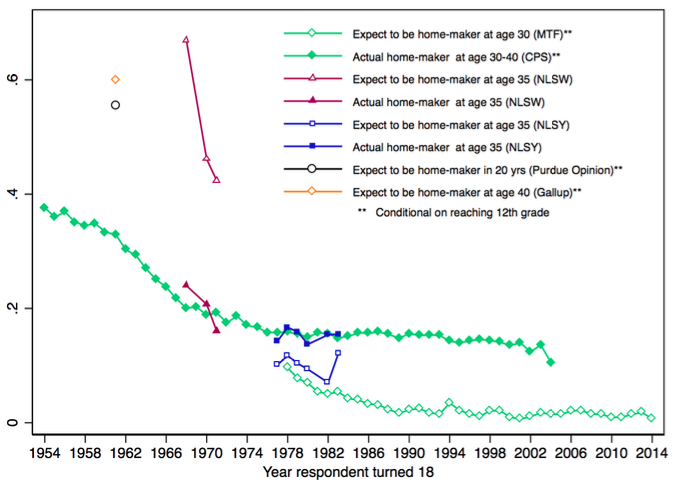 On the other hand, about 10% of the class of 1978 expected to be homemakers at age 30, but ultimately twice as many of them were. Since then, every cohort of graduating seniors has underestimated the likelihood that they would become homemakers. Why has this reversal in expectations versus reality occurred? We argue that the employment costs of motherhood play a key role and, specifically, that across generations, there has been an unexpected increase in these employment costs. 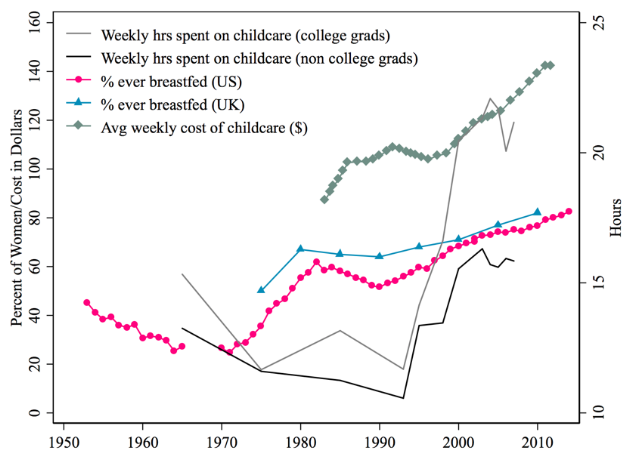 Several papers have emphasised the decline of costs of motherhood as a key driver of the rise in female labour force participation over much of the 20thcentury. For example, electrification that led to the widespread adoption of labour-saving household appliances (Greenwood et al. 2005) and medical innovations such as reduced morbidity associated with childbirth and infant formula (Albanesi and Olivetti 2016) enabled women to better reconcile work and family responsibilities, allowing them to enter the labour force in large numbers. Albanesi, S and C Olivetti (2016), “Gender Roles and Medical Progress”, Journal of Political Economy 124(3): 650-695. Angelov, N, P Johansson and E Lindahl (2016), “Parenthood and the Gender Gap in Pay”, Journal of Labor Economics 34(3): 545-579. Blau, F and LM Kahn (2017), “The Gender Wage Gap: Extent, Trends, and Explanations”, Journal of Economic Literature 55(3): 789-865. Kleven, H, C Landais, and JE Sogaard (forthcoming), “Children and Gender Inequality: Evidence from Denmark”, American Economic Journal: Applied Economics. 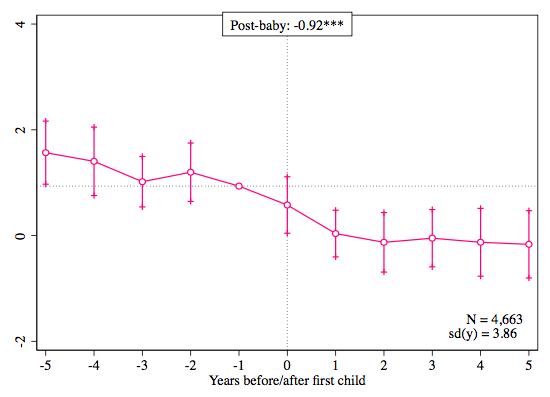 Kuziemko, I, J Shen, J Pan, and E Washington, “The Mommy Effect: Do Women Anticipate the Employment Effects of Motherhood?” NBER Working Paper No. 24740. Greenwood, J, A Seshadri and M Yorukoglu (2005), “Engines of Liberation”, Review of Economic Studies 72: 109-133. Ramey, G and VA Ramey (2010), “The Rug Rat Race”, Brookings Papers on Economic Activity: 129-199.